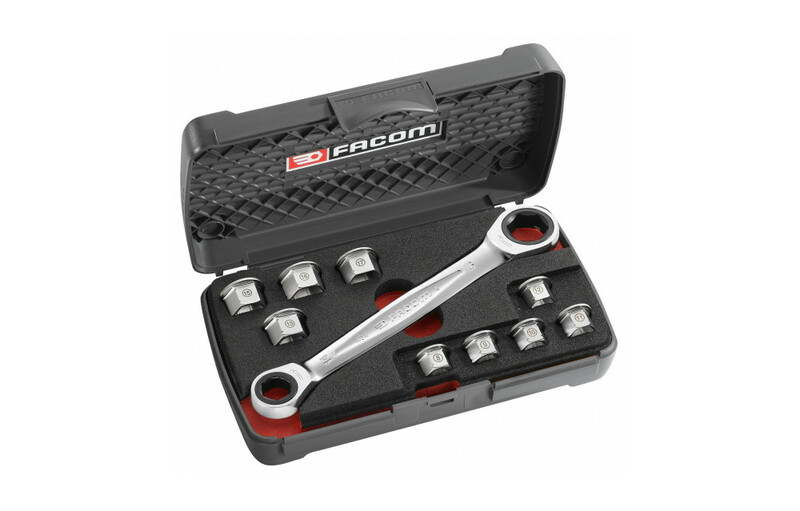 FACOM FLAT TIGHTENING CASE "11 IN 1"
Ultra-light "11 in 1" set: 1 wrench + 9 bushes = 11 dimensions. Ideal for spaces with low access in height. The extra-flat wrench is 3 times slimmer than a traditional ratchet + socket system. Compact ratchet mechanism and reversible by lever. Dimensions of the 2 ratchet heads without bush: 14 and 19 mm. 9 reducer bushes. Dimensions: 8 - 9 - 10 - 11 - 12 - 13 - 15 - 16 and 17 mm.